Having the DRE guide can be very powerful when an insurance company is arguing that a “soft tissue” injury is not a big deal. If you digitize your images and you can objectify that instability is present, you can also give another document showing how significant it may be. 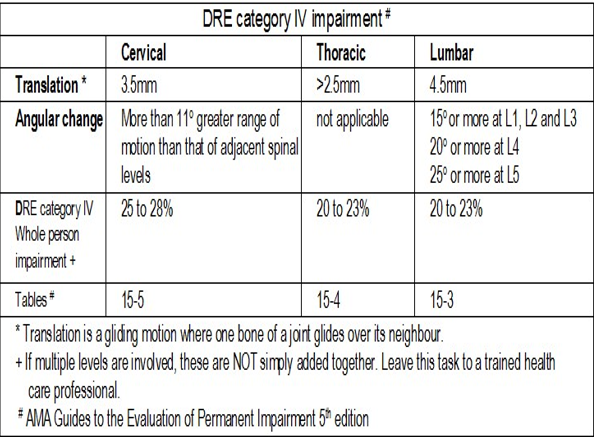 Personally, I do not put this disability impairment in the notes, as I want to encourage my patients to get better. I will add this document in expert narratives or insurance rebuttals. This chart is a document for instability. However, if you do not measure it, you can not objectify that your patient meets this criteria. Having this knowledge can also assist us, the doctors, into understanding why these injuries can be very long lasting and end up chronic.